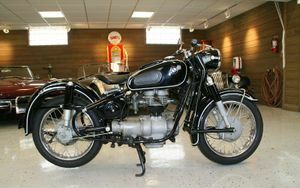 The BMW R27 was a 250cc single cylinder motorcycle made by BMW beginning in 1960. Based largely on the R26, in 1960 the R27 added rubber mounts for the engine and boosted power to 18 hp (13 kW). 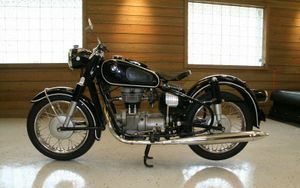 The R27's 250 cc OHV vertical single was the only rubber-mounted thumper engine BMW ever produced, and was their last shaft drive single-cylinder motorcycle. The engine pumped out 18 hp (13 kW), the highest ever for a shaft-drive BMW single. 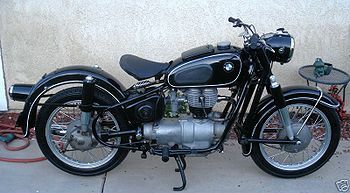 BMW manufactured 15,364 R27 models (engine numbers 372 001 – 387 566 ) over the production years of 1960 to 1966. 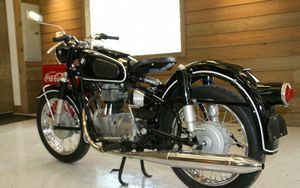 Some of the 1966 R27 models were sold as 1967 models because dealers in those years often would assign dates to BMW motorcycles when they sold them, and not necessarily when they were manufactured. 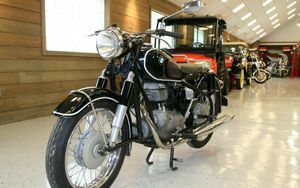 The vast majority of R27 motorcycles exported to the United States by BMW were black with white pin striping. A few, however, were brought in by importer Butler & Smith in a color called Dover white, with black pin striping. Why "Dover white?" Butler & Smith head honcho, Michael Bondy, had a 1942 Packard automobile in an off-white color called dover white. Bondy sent a sample of this color to BMW AG in Munich and asked that it be duplicated. BMW did copy the color, and Bondy ordered fifty motorcycles in that color. Today, BMW motorcycles in original dover white are a sought-after rarity. BMW did things differently from other manufacturers. This is evident in the R27. Its enclosed shaft final drive is rare for a single cylinder motorcycle. 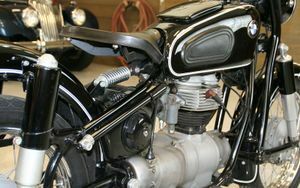 But it also had a triangulated Earles front fork (named after English designer Ernest Earles); so the motorcycle had a front swingarm as well as a rear swingarm. When you squeezed the front brake lever hard not only did the front end not dive, it actually rose slightly. Thus, braking was a very steady activity, though the brakes were weak by today's standards. The engines crankshaft was laid out fore-to-aft, not side- to-side; also a rare feature. This way, the crank and the final shaft were in line, and drive forces did not have to be run through a set of 90-degree gears. Also, the kick starter swung out sideways instead of parallel to the frame, so kick starting an R27 is a rather easy and danger-free affair. 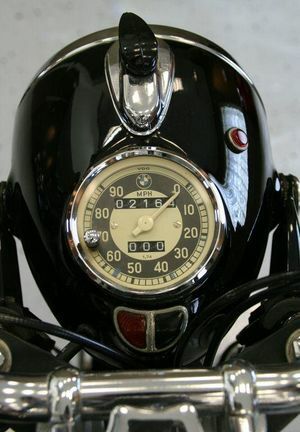 Advanced timing is checked with the motor running at 3000RPM. Adjustment is accomplished by moving the entire breaker plate assembly after loosening two screws and sliding the assembly along elongated holes. This page was last edited on 20 January 2011, at 19:52.